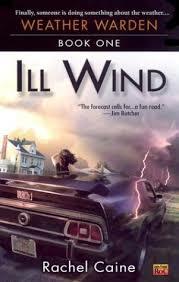 If you've read any of Janet Evanovich's stories about Jersey girl/bail bondswoman Stephanie Plum (such as One for the Money), but missed the sparkle of the supernatural in those tales, check out the first book in the Weather Warden series from Rachel Caine - Ill Wind (Weather Warden, Book 1) . Caine's protagonist, Joanne Baldwin, resembles Evanovich's Stephanie Plum in all the wonderful superficial ways that matter. Hip clothes, fast cars, energetic libido - these two could be good friends if they ever met up. But where Stephanie relies on quick thinking and dumb luck to avoid catastrophe, Joanne has a different approach - she relies on her paranormal control of the weather. Similarly, Stephanie reaches out for help from time to time to a cast of characters who are capable and deadly, but still this side of normal. Joanne runs with a different crowd - Djinnis, for whom the term 'life expectancy' has no meaning to their immortal perspective. Rachel is brought into a complex plot involving those in the highest echelons of her organization of weather wardens and an unspeakable, unsavory affliction. There is only one known cure, and she finds that morally repugnant. (And it is to the author's credit that this is never written out as her motivation, but is instead presented in slow, careful pieces along the course of the story through the protagonist's choices.) Rachel is on a quest to discover an alternative cure. The use of djinnis instead of the by now ubiquitous vampires found in so many books of this genre was much welcomed; and the development of these djinni characters was what I most enjoyed about the story. Also noteworthy is the author's internet site, where I found a sample chapter available: Chapter 1. Try to ignore the creepy automaton mouse tracker girl.